Be the first to share your favorite memory, photo or story of Lew. This memorial page is dedicated for family, friends and future generations to celebrate the life of their loved one. Mr. Raymond Lewis "Lew" Edwards of Greensburg, Kentucky, son of the late Mozella Pruitt Thompson, was born on Sunday, March 12, 1944 in Green County and departed this life on Monday, January 14, 2019 at the Nortons Hospital Pavilion in Louisville. He was 74 years, 10 months, and 2 days of age. He had made a profession of faith in Christ. 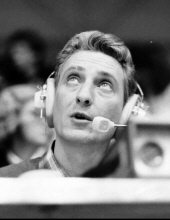 Lew was a Radio Broadcaster and Account Executive currently for Forcht Broadcasting, and had been in the broadcasting business for 54 years. He was also an avid University of Louisville Cardinal Fan and Green County Dragon Supporter. Survived by his wife of 54 years, Mary Lou Howard Edwards of Greensburg, having united in marriage on June 6, 1964. Other survivors include a son: Erik Christian Edwards of Greensburg and his fiancé, Jill Byrne of Campbellsville; a daughter and son-in-law: Kasey Leigh and Blake Gordon of Greensburg; four grandchildren: Zane Edwards and his girlfriend, Ashley Haines of Greensburg, Bileigh Martel and her husband, Chris of Greensburg, Sami Jo Britt and her husband, Hunter of Auburn, and Jackson Edwards of Greensburg; six great-grandchildren: Emerson Martel, Jovi Rose Martel, Abram Edwards, Everly Edwards, Brayden Martel, and Jake Martel; and a host of other relatives and friends. Mr. Edwards was also preceded in death by his step-father: Haskel Thompson; his grandparents: Raymond and Edna Pruitt; and his aunt and uncle: Ruby and Rollin Pruitt. The funeral services for Mr. Lew Edwards will be conducted at 1:00 P.M., Thursday, January 17, 2019 at the Cowherd and Parrott Funeral Home with burial in the Liletown Cemetery. Bro. Bobby Walker and Rob Collins officiating. Visitation is requested from 2 P.M. until 8 P.M., Central Time, Wednesday at the Cowherd and Parrott Funeral Home and after 7 A.M., Thursday until time of the funeral service. Memorials are suggested to the Hosparus Health of Louisville or Hosparus of Green River, which can be made at the funeral home. To plant a tree in memory of Lew Edwards, please visit our Tribute Store. "Email Address" would like to share the life celebration of Lew Edwards. Click on the "link" to go to share a favorite memory or leave a condolence message for the family.